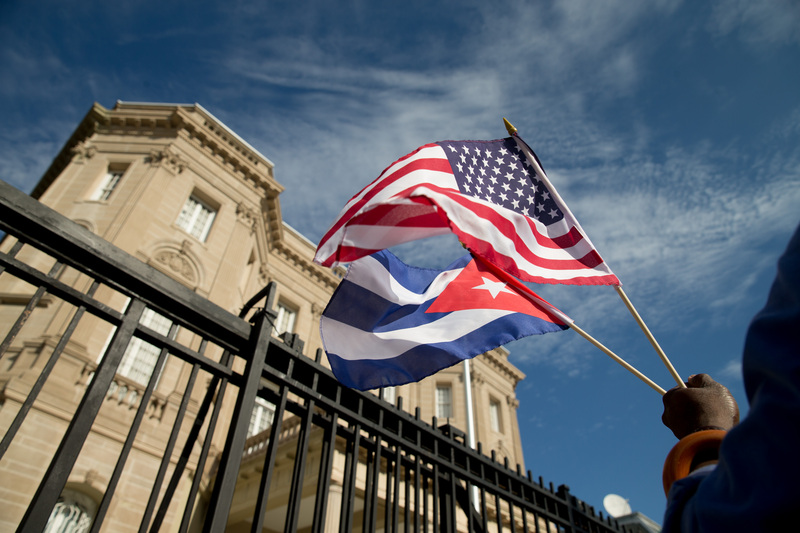 WASHINGTON --The Cuban flag has been hoisted at the country's embassy in Washington. It's a symbolic move signaling the start of a new post-Cold War era in U.S.-Cuba relations. Cuba's foreign minister presided over the flag-raising ceremony Monday, hours after full diplomatic relations with the United States were restored at midnight. Earlier, without ceremony, the Cuban flag was hung in the lobby of the State Department alongside those of other countries with which the U.S. has diplomatic ties. U.S. and Cuban diplomats in Washington and Havana noted the upgrade in social media posts. The United States and Cuba severed diplomatic relations in 1961 and since the 1970s had been represented in each other's capitals by limited service interests sections. Without ceremony in the pre-dawn hours, maintenance hung the Cuban flag in the lobby of the State Department alongside those of other nations with which the U.S. has diplomatic relations. The historic shift was publicly memorialized later Monday when Cuban officials formally inaugurated their embassy in Washington and Cuba's blue, red and white-starred flag flew for the first time since the countries severed ties in 1961. Secretary of State John Kerry will meet his Cuban counterpart, Bruno Rodriguez, and address reporters at a joint news conference later on Monday. The U.S. Interests Section in Havana plans to announce its upgrade to embassy status in a written statement on Monday, but the Stars and Stripes will not fly at the mission until Kerry visits in Aug. 14 for a ceremonial flag-raising. In Havana, the U.S. Interests Section uploaded a new profile picture to its Facebook account that says US EMBASSY CUBA. And, Conrad Tribble, the deputy chief of mission for the United States in Havana, tweeted: "Just made first phone call to State Dept. Ops Center from United States Embassy Havana ever. It didn't exist in Jan 1961." And yet, though normalization has taken center stage in the U.S.-Cuba relationship, there remains a deep ideological gulf between the nations and many issues still to resolve. Among them: thorny disputes such as over mutual claims for economic reparations, Havana's insistence on the end of the 53-year-old trade embargo and U.S. calls for Cuba to improve on human rights and democracy. Some U.S. lawmakers, including several prominent Republican presidential candidates, have vowed not to repeal the embargo and pledged to roll back Obama's moves on Cuba. Still, Monday's events cap a remarkable change of course in U.S. policy toward the communist island under President Barack Obama, who has sought rapprochement with Cuba since he first took office and has progressively loosened restrictions on travel and remittances to the island. "It's a historic moment," said longtime Cuban diplomat and analyst Carlos Alzugaray. "The significance of opening the embassies is that trust and respect that you can see, both sides treating the other with trust and respect," he said. "That doesn't mean there aren't going to be conflicts - there are bound to be conflicts - but the way that you treat the conflict has completely changed." Cuba's ceremony at the stately 16th Street mansion in Washington that has been operating as an interests section under the auspices of the Swiss embassy will be attended by some 500 guests, including a 30-member delegation of diplomatic, cultural and other leaders from the Caribbean nation, headed by Foreign Minister Rodriguez. The U.S. will be represented at the event by Assistant Secretary of State for Western Hemisphere Affairs Roberta Jacobson, who led U.S. negotiators in six months of talks leading to the July 1 announcement, and Jeffrey DeLaurentis, the chief of the U.S. Interests Section in Havana who will now become charge d'affaires. Both interests sections have technically operated as part of Switzerland's embassies in Washington and Havana. The Swiss also were caretakers for the former American Embassy and ambassador's residence from 1961 to 1977, when the U.S. had no diplomatic presence in the country at all.